The process of creating a Database Availability Group (DAG) in Exchange Server 2013 (Preview) is largely the same as in Exchange Server 2010. You can choose to create a DAG via either the Exchange Administrative Center (GUI) or through the Exchange Management Shell (PowerShell). I prefer using the Exchange Management Shell over EAC as it provides you more information over the process. Note In order for this process to complete successfully, you need to have the appropriate permissions on the container in which the object is created. By default this will be the “Computers”-container. 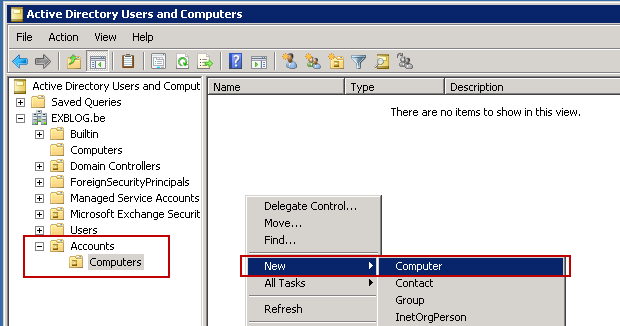 However, it is possible that your Active Directory has been reconfigured to use another container/OU as default location for new computer accounts. Have a look at http://support.microsoft.com/kb/324949 for more information. Another way to get around the possible issue of permissions, is to create the Cluster Name Object (CNO) upfront. This process is also called “pre-staging”. 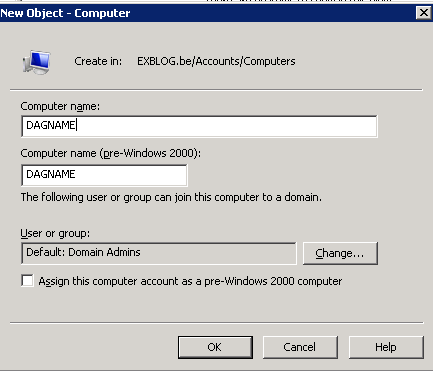 Doing so will allow you to create the object up-front with another account (that has the appropriate rights) so that you don’t run into any issues when configuring your DAG. Stay tuned! In an upcoming article, I will be talking about configuring high availability for the Client Access infrastructure in Exchange Server 2013 as well as a topic on high availability (more general).